Happy Monday everyone! I hope you had a fantastic weekend. Maybe you picked up a Pumpkin for your front porch, or even carved it? My weekend was filled with Halloween inspiration from both the DCWV team blog hop AND the Inspiration Crew event! With that being said, it's time for me to pick a random winner of my Halloween prize pack! Congratulations Iris!!! Enjoy all those fabulous goodies! Thank you to everyone who joined me throughout the week, it was a lot of fun and I loved reading all the great comments! Now time for my regularly scheduled post! 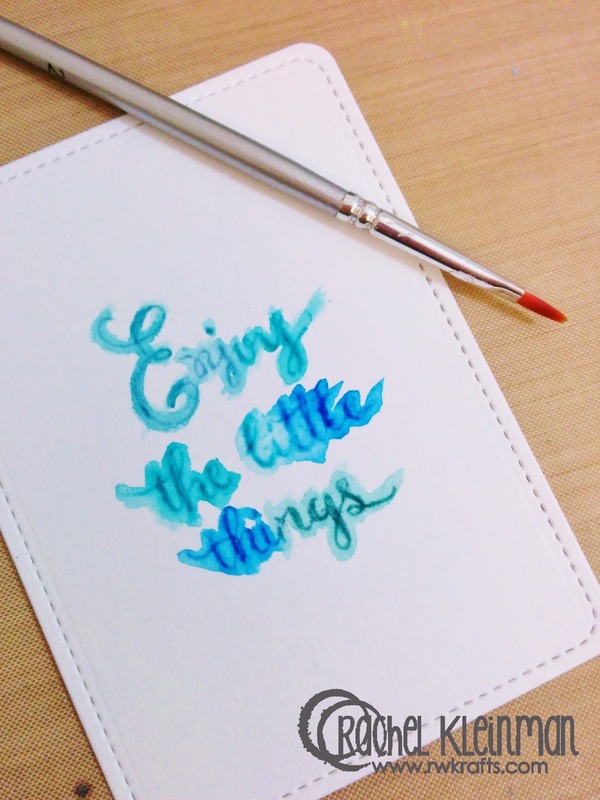 I had some fun using Distress Markers to watercolor a sentiment from the Sweet Stamp Shop "Enjoy Calligraphy" set. 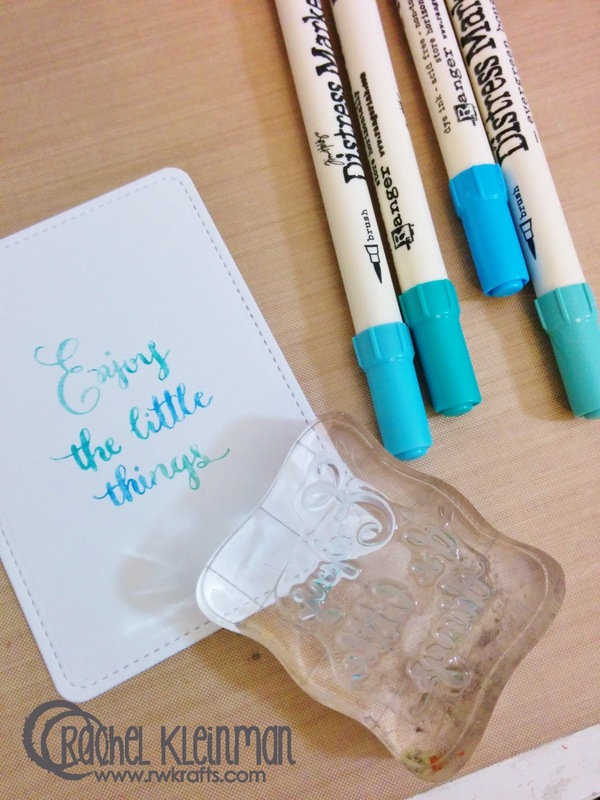 Step 1: Ink up your stamp by applying Distress Markers directly to the stamp. 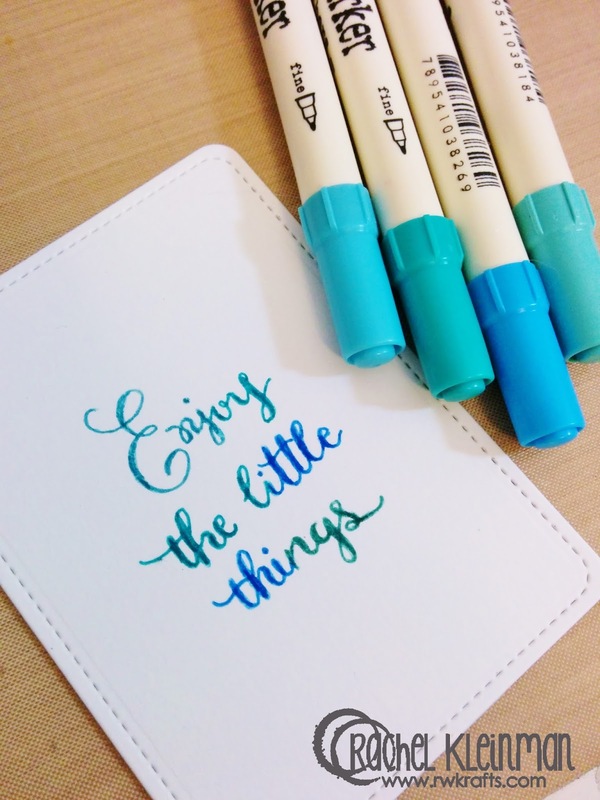 I used a variety of blue shades and let one color blend into the next. Before you stamp on the paper, give it a nice ol' HUFF of your own hot air. This will reactivate any ink that may have dried. Step 2: (optional) Trace over the image using the same colors you did when you stamped it. I did this because I wanted to make sure there was enough ink on the page. You can skip this if you'd like. Step 3: With a thin paintbrush and some water, trace over the sentiment. The colors from the Distress Markers will begin to bleed away from the sentiment. 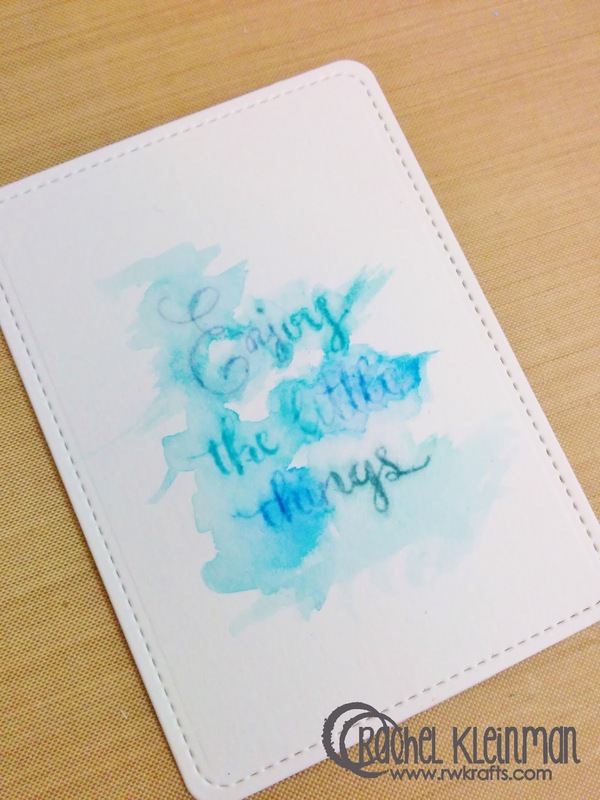 You will want to use watercolor paper for this project! Step 4: Now just go over the image with your brush and water. I added a lot of water in some spots and less in others. I did this so my image would 'bleed' a lot more. Step 5: Once the paper has dried completely, stamp on top of the original sentiment with black ink (I used Ranger Archival Black... it's water resistant). Back to my disclaimer... I should have stopped here! I don't know why I kept adding more color, more water, more color... eventually you couldn't tell that I had done all of this coloring and tracing with the sentiment. Oh well, live and learn! I just got carried away in all the painty fun. 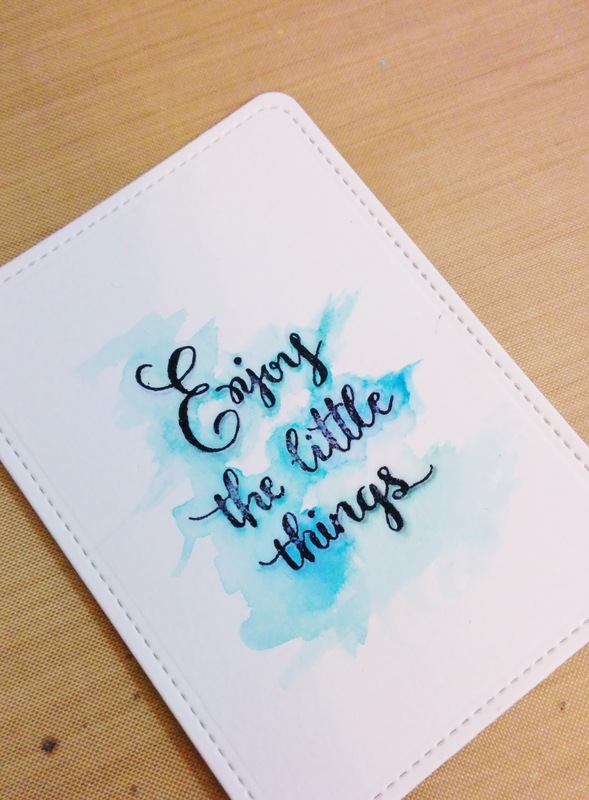 The sentiment is from this beautiful "Enjoy Calligraphy" set by the Sweet Stamp Shop. I plan to try this technique again with the Walt Disney quote. You'll see me use this set (and many others!) 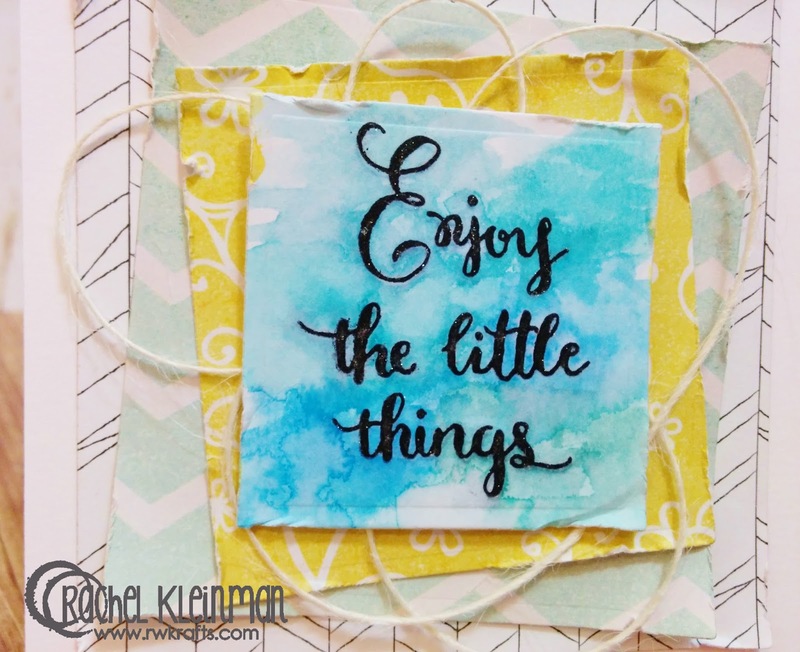 again on Wednesday over at the Sweet Stamp Shop Blog. I hope you're following them and I'll see you there soon! I am thrilled to be the winner of the Halloween prize pack and emailed you my address on Nov 2. Thanks! Unity Thursday - New Holiday Releases! Halloween Inspiration Event - Last Day! Halloween Inspiration Day 6 - DCWV HOP! Halloween Inspiration Event - Day 5! Halloween Inspiration Event - Day 4! Halloween Inspiration Event - Day 3! Halloween Inspiration Event - Day 2! Halloween Inspiration Event - DAY 1! Unity Kicks Off the Holidays!